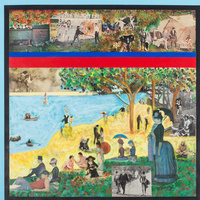 Join the Museum of Contemporary Photography for a public opening reception for The Many Hats of Ralph Arnold: Art, Identity & Politics and Echoes: Reframing Collage. During the tumultuous 1960s and 70s, the prolific artist Ralph Arnold made photocollages that appropriated and commented upon mass media portrayals of gender, sexuality, race and politics. Arnold’s complex visual arrangements of photography, painting and text were built upon his own multilayered identity as a black, gay veteran and prominent member of Chicago’s art community. Join in the celebration of this exhibition which also features work by Arnold’s contemporaries and colleagues, including Robert Rauschenberg, Ed Paschke, Ray Johnson, and Barbara Jones-Hogu, which add context and enrich our understanding of Arnold’s legacy. A companion to The Many Hats of Ralph Arnold: Art, Identity & Politics, Echoes: Reframing Collage examines the parallels between Chicago-based artist Ralph Arnold and 21st-century artists working with similar media, including Wardell Milan, Nathaniel Mary Quinn, Paul Mpagi Sepuya, Ayanah Moor, Krista Franklin, and Xaviera Simmons. These contemporary works serve to further deepen our understanding of Arnold’s lasting contribution to Chicago’s creative legacy.